In Stock. Sold by Beauty Innovations Inc. and Fulfilled by Amazon. Gift-wrap available. THE BEST SMELLING & EFFECTIVE FRANKINCENSE OIL - 100% pure and natural, no additives, undiluted with no filters, vegan, and cruelty free. Treat yourself to a large 4 oz bottle of quality frankincense oil that can help promote relaxation, focus, and healthy skin by rehydrating and reducing scars. Satisfaction guaranteed! If you don’t feel the same way we do, contact us for a full refund. PREMIUM QUALITY GLASS DROPPER - Comes packaged with a dropper for ease of use. 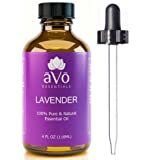 MULTIPURPOSE DIY - Great for aromatherapy, massage, skincare, diffusers, homemade blends, bath bombs, laundry, repellant sprays, and use in homes, offices, and gardens. AROMATHERAPY - It is ideal for scars, stretch marks, dry aging skin, anxiety, stress, and hair. Find out why it's one of the top essential oils with our Radha Beauty Frankincense Oil. Bring relaxation, wellness, and a sense of satisfaction to your day! 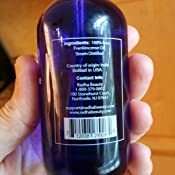 PACKAGED IN THE US - Our cobalt blue bottles provide superior ultraviolet light protection and ensures that our 100% pure and steam distilled frankincense oil will be in quality form from start to end. 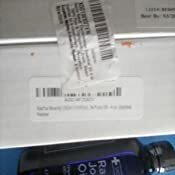 Sold by Beauty Innovations Inc. and ships from Amazon Fulfillment. Radha Beauty Rosemary Essential Oil - 100% Pure Therapeutic Grade, Steam Distilled for Aromatherapy, Relaxation, Scalp Treatment, Healthy Hair Growth, Anti-aging, Dry Skin, Acne Skincare, 4 oz. 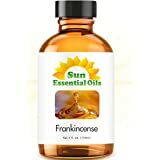 Majestic Pure Frankincense Essential Oil, Organic Certified, Premium Quality Frankincense Oil, 4 fl. oz. This is my 2nd purchase of this oil. My first bottle faded an ugly, dark purple age spot on my face into near invisibility, got rid of a rash on my left shin, shrunk several weird spots on my skin, healed my sore gums in 2 days, relieved itching on some (blush) sensitive lady spots, healed sore flip-flop skin between toes, made my face ... hmm ... I guess "look brighter" is how I would describe it, softened rough skin ... Gee, sounds like I was a wreck before frankincense oil--lol--but I love this oil. My current project is to fade age spots on the backs of my hands. After the age spot on my face disappeared I have complete faith in this product. 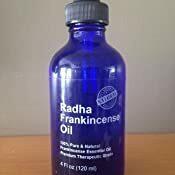 I've tried the way more expensive Do----- brand and love Radha frankincense as much if not more. 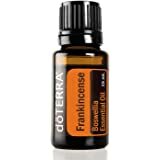 Have been doing research on frankincense oil and learned new ways other people use it. Can't wait to try them all. ***Update on new use for Radha Frankincense Oil: My husband who has diabetes has been using it on his feet every night (mixed with a carrier oil) and he says he has more feeling in his feet than before and no more needles and pins pain. I think frankincense is a miracle oil. 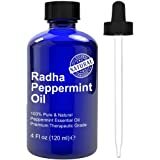 I am very pleased with the Radha oil. 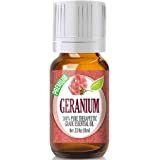 After reading homeopathic ways to help with ganglion cysts (mine is deep within my wrist, doctors were saying surgery was the only way to treat it) I read of several people using Frankensence oil. And after a week of massaging it twice a day with this oil, my cyst has shrunk tremendously!! I'm actually going to give yoga a try again, since the pain in my wrist made me stop! 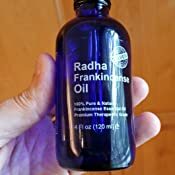 When I read so many reviews about the amazing powers of the Radha Frankincense oil, I had to try it. Here's what I found. 1) I could put it on my face without irritation. Although my skin is not overly sensitive, the initial use of any new product makes me a little nervous about if it will cause irritation, redness, or breakouts. This passes all the tests for being kind to even the most delicate skin. 2) Even after fairly consistent use at night, I'm not noting any big changes and didn't experience any of the super powers of this product that some reviewers seemed to. I have pretty good skin to begin with, so maybe I should be happy with that and not expect improvement. I do have some fine lines, and saw no improvement in those. It seems to do a decent job of moisturizing. I hate to give up on a product that is so reasonably priced and that others have had such great results with. 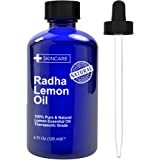 However, what seems to be working best for me now is The BEST ORGANIC Vitamin C Serum - [BIG 2-OZ Bottle] - Hyaluronic Acid, 20% C + E Professional Topical Facial Skin Care to Repair Sun Damage, Fade Age Spots, Dark Circles, Wrinkles & Fine Lines -2 oz. 5.0 out of 5 starsBest Skin therapy EVER! It’s no accident that the wise men took Frankincense as one of the Gifts of the Magi! I’ve used it for SOooo many things...it completely removed a nasty red raised spot on my chest, faded a dark brown patch on my cheek and totally got rid of a patch of flat raised brown things in my hair line. The dermatologist said he could remove them but I’d likely lose the hair in that area and would have a bald spot. 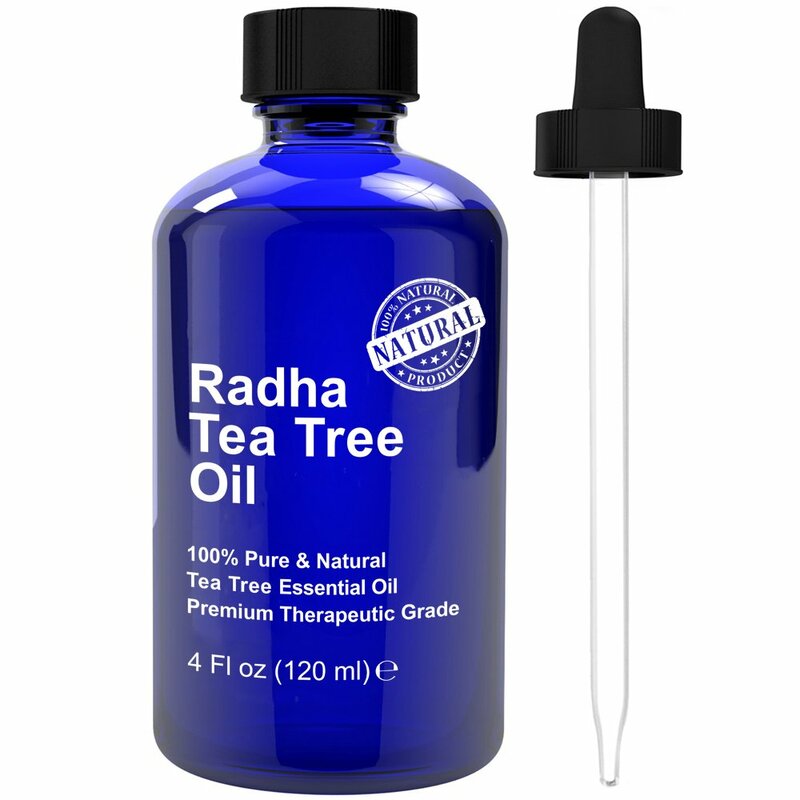 This oil removed them and my hair was undamaged. Love this magical oil - it’s saved me tons of pain, aggravation and money!! You have to apply it daily, and some things take weeks to “dry up & fall off” but it sure beats a visit to the dermatologist to charge me $70 per skin tag!! Yipeeeee! So glad it’s available again! I love this brand of essential oils. I have used them to heal so many things. Not only for myself-but for pets. I would be very careful with keeping the dropper in the Frankincense bottle. I have found out -by experience. I had traveled with it in the bottle. The rubber part of the dropper had disintegrated while in my suitcase. And it had leaked on my other toiletries in the bag. So please, make sure to use the original cap on it. And only use the dropper -as needed. 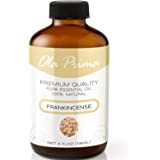 Frankincense is great for any type of skin problem. I use it on anything that appears on my body, Red spots,dark spots, extra dry skin, anything and everything. Depending on the type of problem- I usually mix it with a carrier oil. But most of the time I use it alone. A person that I live with has a dog. The dog had big lumps and sores appear on the top of his head. They looked like large blackberries, I rubbed some of my Radha Frankincense Oil on them. They decreased in size -by that evening. They were completely gone -by the third day. So amazing! A miracle oil! I think this is a great purchase. 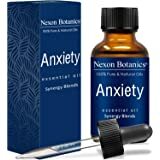 My wife has been researching the benefits of essential oils and I wanted to purchase something that we used often that would last a little longer. 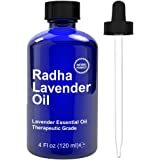 I can not tell the difference between Radha frankincense and other, more expensive oils and this has been very beneficial for my family. 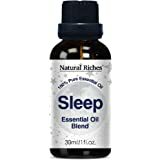 I absolutely love this oil. 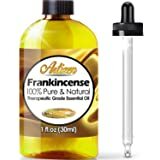 I am new to essential oils and I had been concerned after reading how only the pure Frankincense will work and how expensive the true pure Frankincense is. My son has very active Boston Terrier pup that loves to grab my arms and chew and he accidentally scratches and bites me leaving horrible marks. I have a hard time healing and these lesions stay bright reddish/purple and strangers have asked me if I have psoriasis. After only a few applications, my left arm is practically healed and my right arm which was the worst is 90% healed. I have tried a lot of different creams, ointments and lotions that have helped but not came anywhere close to this wonderful healing product. I am so thrilled with this product.